As per quality management system, each material identification & traceability is very important to maintain quality system in company there is no matter the unit is in scope of audit or not but the unit is connected transitions with company other parts that need to maintain quality records and its requirements should be fulfill, same as the office materials are generally purchased from consumable goods purchase department, which is directly concern with the quality documents and its clauses requirements, hence the office equipment requirements should be in track to find out the each purchase material, consumption and stock of the each material purchased by purchase department. Office equipment requisition form is used for the request to procurement department as requirement of internal office used, these requisition form owners is procurement department but fill up by end user for the request material for purchase from outside or arrange internally. 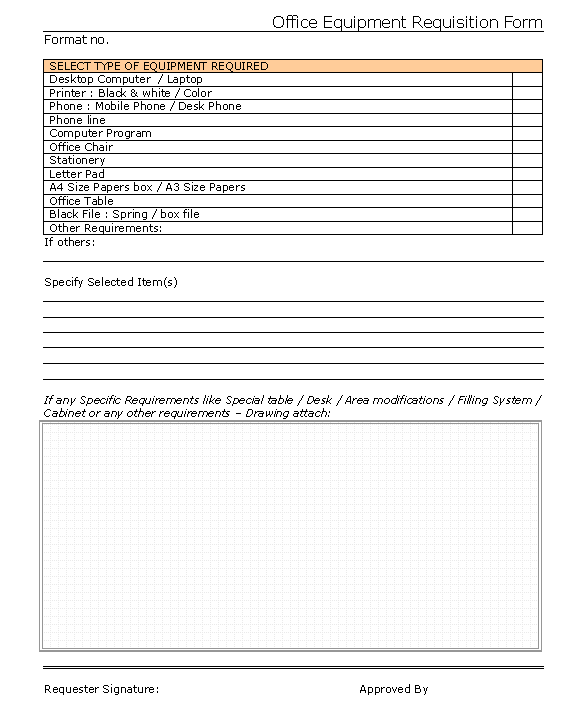 Office equipment requisition form, as you can see picture below all the required and generically used in office material are triad to incorporated and also given below side of form for drawing section in case of the interior change, material drawing etc.. all the requirements and equipment detailed information is must for the clear understanding, hence you can modify this format if you feel that possible after download with below links, here format is given for download in word document format for easier to everyone for amendment.